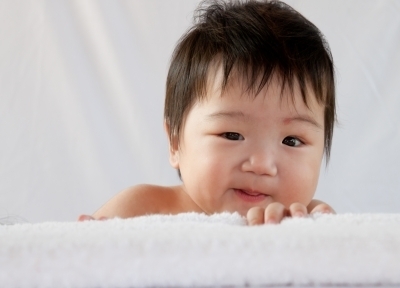 We have all said it and written it a million times: Your baby needs Tummy Time every day! But do we ever take the time to explain what that means or why it’s important? Maybe if we took the time to explain to caregivers the benefits of Tummy Time, they would understand the need to create opportunities to promote Tummy Time. What are the benefits of Tummy Time and what are the essential suggestions we should be giving caregivers to promote the use of Tummy Time, throughout the day? Tummy Time can be more than just a position, it can be an activity to engage with a child and develop necessary strength and developmental skills. When Tummy Time incorporates active play it gives parents the opportunity to work on head control, eye contact, shoulder girdle strength, vocalizations, engagement, and social interaction. Playing while on the tummy develops initial upper extremity weight shifting skills, strength of the upper back and trunk muscles, postural control, and proprioception. It also helps the baby to dissociate his head from his trunk and use the muscles around his eyes. Although initially Tummy Time is a passive position, we must encourage caregivers to actively engage with the infant. Suggest to the caregiver to sing songs while the child is laying on their chest in the morning in bed or play peek-a-boo with a blanket on the floor or knock over cups or any other fun age-appropriate activity that engages the child while on their tummy. Check out these sites for more ideas about Tummy Time. Remember to personalize these guidelines to include active play games for the caregiver and the child. Families who receive early intervention services participate in the development of the Individualized Family Support Plan (IFSP). The IFSP is the document that describes the family’s resources, priorities, and concerns and identifies the support plan for the family. The outcomes on the IFSP determine the focus of the support plan as well as services that will help meet the needs of the family and child. Similar to other benchmarks, the outcomes on the IFSP need to be objective and measurable and time specific. They also must describe how the child’s participation in activities and routines will be enhanced. Outcomes are more than skill development goals. Outcomes must clearly indicate what the child is expected to do or would like to do. Let’s set up two examples of outcome writing. Johnny is a two-and-a-half year old boy who is having difficulty communicating his wants and needs. His family would really like him to talk more. Sometimes his parents have to go through a whole litany of foods to find out what he would like to eat. Johnny’s parents told the IFSP team that it would make meal time more fun if he could only tell us what he wants! To help the family with their concern the IFSP team developed a variety of outcomes that they thought would be appropriate. In 3 months, Johnny will use a gesture or word to make a choice between two food items during breakfast and lunch each day. In 3 months, Johnny will label 10 pictures of food correctly for 7/10 trials. In 6 months, Johnny will increase his vocabulary by saying 15 new words. In 6 months, Johnny will use a single word to request his cup throughout the day when he is thirsty. Which of these outcomes do you think best meets the needs of the family? Why? Let’s look at these outcomes closely to see which ones are examples of outcomes to include on the IFSP. This outcome gives a time frame (3 months) for when the outcome is expected to be met and clearly states who the outcome is about (Johnny). This outcome is measurable in that Johnny will need to perform this skill consistently during 2 meals each day. When Johnny meets this outcome, it will be helpful for his family because they will know what he wants to eat. This outcome also gives a time frame (6 months) and clearly states that Johnny is the person the outcome is about. This outcome is measureable–We know Johnny will have met this outcome when he has 15 new words. However, this outcome may or may not be helpful for the family. Johnny’s new words could be anything from animals to names of family member’s. Also, Johnny could achieve this outcome without ever learning to use his words to communicate his wants and needs. While this outcome is measurable and gives a specific time frame, it is not very helpful for the family and would not help Johnny increase participation in routines. Like outcome #1, this outcome meets our criteria for a good outcome. It is measurable (Johnny will use a single word to request his cup when he is thirsty. This would be helpful for the family because they would no longer have to guess if Johnny is thirsty or hungry or neither. We know that we expect Johnny to meet this outcome in the next 6 months. This outcome reflects Johnny learning in a natural context. Click this link to the ECTA Center for more resources on writing outcomes. Is one time a week really enough? The PSP model does not stipulate that the primary provider can only see the family one time per week. The frequency of the visits by the PSP model should be determined by the IFSP team during the IFSP meeting. The decision should take into account the caregiver’s level of comfort in providing strategies and the family’s schedule. Some professionals advocate for starting with a high frequency of service and tapering off as the caregiver’s confidence and competence increase. Also remember that the IFSP can be changed at any time. If the team recommends one time a week initially, but later feels an increase (or decrease) is necessary, the team can call an IFSP meeting to make the change. Are you sure I only need one provider to meet all of my concerns? The PSP model does not mean a family will only have one provider. The intent of the model is not to say that families have to choose between physical therapy or speech therapy. Remember that the primary provider has a team of professionals working with them to meet the child’s needs. Consultation visits can occur in which the primary provider, the consultant, and the family all meet together to observe the routines and embed strategies. How is an SLP supposed to do a PT’s job? The short answer is they aren’t. The focus of early intervention services is on supporting families to increase caregiver confidence and competence. Providers focus less on direct interaction with the child and more on educating the family about strategies to promote development. An SLP has basic knowledge of development, including motor development, and is, therefore, capable of making basic recommendations. Remember that a child does not work on developmental areas in isolation. An SLP is “working on” on all areas of development all the time. It is expected that the SLP would ask the PT to consult when questions or concerns arose that she was not comfortable answering or addressing. Shelden ML & Rush DD (2013). The Early Intervention Teaming Handbook The primary service provider approach. Baltimore, MD: Brookes Publishing. Dunst, CJ, Brookfield J, & Epstein J (1998). Family-centered early intervention and child, parent and family benefits: Final report. Asheville, NC: Orelena Hawks Puckett Institute. Provide background information about the purpose of your questions. Families may be more willing to provide information when they know why they are being asked. Remember that a routine is not the same as a schedule. Routines are activities that happen in a predictable sequence. All families have routines, even though they may not have a set schedule of when certain routines occur each day. Expand your definition of a routine. Getting the mail, washing hands, and helping to prepare meals are predictable, functional activities. Each of these activities contain multiple opportunities for learning. Use open-ended questions! Ask the family what works well within the routine and what does not. Can you show me? Observing the routine as it typically happens will provide an opportunity to ask follow-up questions and problem solve with the family for solutions. Use coaching strategies to guide questioning. Ask questions to help the family come up with an answer that works for them. Avoid suggesting alternatives without family input. Observe items and objects in the family’s home that may provide clues to the family’s routines. For example, by observing a baseball hat and glove near the back door, you may learn, after questioning, that the family spends the entire weekend at the ball park watching a sibling play baseball. Embedding strategies into the family’s ball park routine might be beneficial for this child. Be respectful. Routines vary greatly from family to family. It is important for providers to keep an open-mind when working with families. If a formal tool such as the Routines-Based Interview (RBI) has been used to complete the IFSP, consider using the information obtained from the RBI to guide follow-up questions with a family. Published instruments such as the AEPS Family Report and the HELP Family-Centered Interview can also be used for routines assessment. In addition, simple questionnaires and handouts to guide conversations with families are available online. Visit http://tactics.fsu.edu for more information. Finally, remember that routines assessment is an ongoing process. The routines of a family will change over time just as intervention strategies will change as the child’s strengths and needs change. By knowing how to gain information about a family’s routines, providers can offer meaningful strategies for a family and increase the child’s participation in activities. Workgroup on Principles and Practices in Natural Environments (February, 2008) Seven Key Principles: Looks like/doesn’t look like. OSEP TA Community of Practice-Part C Settings. http://www.nectact.org/topics/families/families.asp. ECI in DC: What do we know about Part C Implementation?